Welcome to GÎtes de Camors, our lovingly and tastefully restored 17th Century Farmhouse, Longère, Cider Press and 1 bed Cottage, set in our own grounds with lovely garden and heated swimming pool. 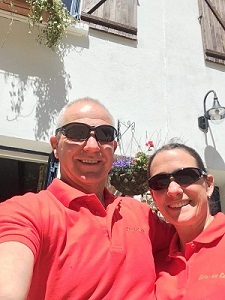 Stewart & Tamsin Welcome You! Catering for families from 2 to 15 - Open All Year!. 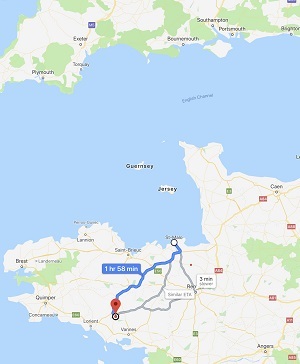 We are nestled in the beautiful Breton countryside overlooking farmland and surrounded by forests, yet only 3km away from the local town where you will find all the amenities you could need. 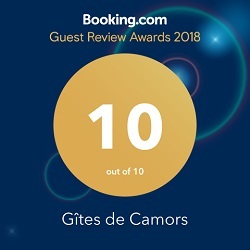 Gîtes de Camors has been recently refurbished and provides all the modern conveniences you could need, including fully fitted kitchens, washing facilities, TV, and Wi-Fi throughout. Yet by using local materials and traditional furnishings it still maintains its rustic charm. All properties have access to the seasonal heated swimming pool and lovingly tended gardens. They also each have a private garden, outside barbecue and eating area with picturesque countryside and woodland views. Although in a tranquil setting, Gîtes de Camors is only a short drive from the coast and stunning beaches such as Carnac and Erdeven, made all the more attractive thanks to the microclimate this region boasts. There are numerous attractions to discover, from medieval towns such as Josselin and Auray, shopping in Vannes or Lorient, canoeing, fishing, walking, cycling, horse riding, tennis, golf… there really is something for everyone! For lazy days “at home” we provide games, books, a DVD library, satellite TV, craft activities and free Wi-Fi throughout. We provide you with a complementary Welcome Pack on arrival and also offer babysitting, a taxi service, bread delivery and lots more extras. Anything else you may need, just ask: if we have got it, you can have it! Only 2 hours drive from St Malo. Take the car ferry from Portsmouth to St Malo or from Plymouth to Roscoff. Flights are also available into Dinard, Brest or Rennes. All the airports have several car hire firms. From either airports or car ferries, the journey is very picturesque and the roads are clear. The journey from the airports and car ferries takes from 1.5 to 2.5hrs, depending where you land! Once in France head towards Baud & then Camors, which is only 3km away. *** Save 10% on your Britanny Ferries Journey - Ask Us For Your Discount Code! If you enter "Le Gamerf" into your SatNav, then you will be brought immediately to our property!